ModCloth is holding a new contest via Instagram and I'm happy to be one of the guest judges! 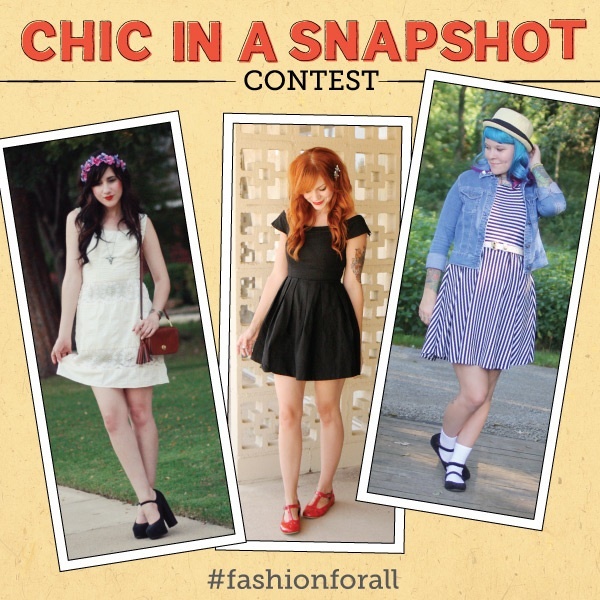 The Chic in a Snapshot Contest on Instagram is your chance to win a $100 gift certificate to ModCloth. All you need to do to enter is take a head-to-toe photo of your most stylish look, then post it to Instagram with the hashtag #fashionforall (by 11:59 p.m. PT on 9/14). If you like, you may also include up to two detail shots. Bonnie from Flashes of Style, Kaylah from The Dainty Squid, and I are sharing some tips on snapping outfit photos over on the ModCloth blog. At the end of the contest we'll each select a favorite to win a $100 ModCloth gift certificate! You can find us all on Instagram under the names @skunkboycreatures, @flashesofstyle, and @thedaintysquid. I hope to see you over there! I have two pictures tagged, but they are the same outfit. One of the shots cuts my head off so I wanted to show you that it is really me and my outfit! Hope that is okay! Very exciting! I can't wait to enter this!